Updated and rethought for 2017, the entry-level range of Bailey caravans aims to simplify the buying process – does it work in the sub-£15k Pursuit 400-2? The upmarket Unicorn may be the biggest-selling range of Bailey caravans, but that hasn’t stopped the company being innovative in other areas. In launching its new Pursuit line, for example, Bailey has dispensed almost entirely with option packs: those items that are often a huge hindrance to anyone trying to work out a new tourer’s true price. Instead, the company is aiming for one clear cost, with many items that were previously considered optional extras fitted as standard. As you might expect, that has added to the price of the range (although not to the overall unladen weights, which all stay under 1500kg). In fact, with two new family layouts coming into the line-up for 2017, it’s possible to find a Pursuit retailing for as much as £16,249. The company says that, with the boosted kit levels, the Bailey Pursuit can’t really be considered a budget van any more – and at that price, it can’t. But there’s still one model in the range – the two-berth 400-2, which continues into 2017 – that costs less than £15,000, at £14,599. Given the generous standard spec levels, is it an enticing buy? Let's find out! And to see other Bailey caravans for sale, click here. The extras that Bailey has now fitted as standard are evident from the start. Like all new Pursuits, the 400-2 comes with an Al-Ko AKS3004 stabiliser and Al-Ko Secure wheel lock receiver as standard – the actual lock is a £225 option. Given that the van is relatively lightweight, that should make towing easier. There’s the same Alu-Tech construction with GRP outer skin on an Al-Ko galvanised chassis, but the bumpers and wheelarches have been updated, the alloy wheels come as standard, and the less box-like, more curvaceous rear is now almost exactly like the Unicorn’s. You might also notice the sunroof above the front window: that also now comes as standard. With a warm Mendip Ash furniture finish, a worktop laminate known as ‘Burnt Oak’ that at first glance looks like slate, and a crimson, blue and pale-grey colour scheme for the Festival upholstery, the interior of this Bailey Pursuit 400-2 looks much more modern. The sunroof really does make a difference in letting in light. But you shouldn’t feel deprived at night-time either, thanks to the directional, individually switched spotlight over each settee, in addition to four LEDs around the rooflight. You’ll be pleased to see that the radio/CD/MP3 player – with speakers in each corner – comes as standard. And you’ll be warmed, too, by the well-placed vents carrying air from the 2kW Truma Combi heating system – again, fitted as standard. However, there are some signs of cost-cutting. The lights and heating are controlled by an easy-to-understand panel by the door, which is itself helpfully lit by two further LED lights. Next to this is a pair of hooks. But under them is a space that is crying out for a mirror, but which doesn’t have one fitted. The shelf over the door feels slightly flimsy, too. The fold-away table is stored in a slightly awkward slot immediately under the offside settee, beneath slats that have no hydraulic support. This means you’ll need to move settee cushions every time you want to eat, or any time that you need to get something out of the large space underneath it: there is no other access to this area. To be fair, this could be because of the caravan’s length, rather than its budget price-tag, because longer models in this range do have tables that are easier to access. When you do get it out, the table isn’t particularly big, but there is a pull-up flap between the settees at the front that you can employ when eating a quick snack. There is a sizeable sideboard across from the kitchen where you could easily store a TV – it has sockets at the ready, too. The extras fitted as standard don’t fall short in the kitchen, either. Along with the same three-burner hob, 103-litre Dometic fridge and Thetford Triplex oven and grill as before, 2017 Bailey Pursuits now come with an 800kW microwave. The square, stainless-steel sink comes with a separate, sturdy drainer that you can easily place on the extension flap, and this area is well-lit thanks to a trio of LED lights. But that extendable work surface doesn’t disguise the fact that the overall amount of workspace is on the small side. In terms of storage, there’s a small pan locker beneath the cutlery and utensil drawer under the oven, one shelf above the microwave, and one dedicated overhead locker complete with crockery racks. You’ll likely need to use the storage in the sideboard, which is cavernous. The large end washroom in this Bailey Pursuit 400-2 could just about fit two people at once, if you both needed to ablute at the same time. It features a nearside separate shower cubicle that is a good size – it comes with a rooflight, but only one drainage hole. On the offside is the loo and a large wardrobe. The latter has two shelves and a full-height hanging space, something of a Bailey speciality. In between is a small washbasin, with a cupboard and a mirror. There’s also a vacant space that again seems to want something – possibly a toilet-brush holder. You do at least get a window, but it’s not opaque. For 2017, Bailey caravans have Ozio fibre mattresses, which you’ll also find in Elddis, Compass and Coachman tourers. These make for two flat and comfy singles, and an even better double, which is easy to assemble thanks to slats that pull out from a central locker in the front. The seat-base cushions themselves have cleverly been divided just at the end, so you don’t have to struggle with turning over the small section on either side of the pull-up flap. Thanks to the large wardrobe, there’s plenty of room for packing away your clothes in this caravan, even if kitchen storage is – as previously mentioned – somewhat limited. Once you lift the table, the offside under-seat locker is clear. But the nearside example is taken up by a spare wheel (again fitted as standard) and electrics. So storing bulky items could be an issue, particularly given that neither area can be accessed from outside. There are five overhead lockers in addition to that in the kitchen, but none of them are shelved. Each features a solid door that slams down a little harshly. Full marks have to go to Bailey for dispensing with the options-pack system that usually only serves to confuse buyers: the pricing structure is now much easier to understand. 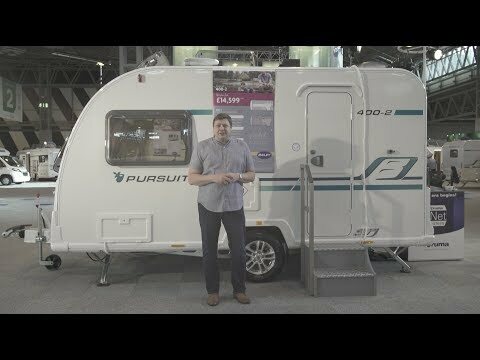 As a result, the revamped two-berth Bailey Pursuit 400-2 presents a very compelling offer for the money, let down only by a slight shortage of storage opportunities. The interior also looks more bright and breezy than in the previous incarnation.